Hey Siri – what does the future hold for social care technology? Home News Research & Innovation News Hey Siri – what does the future hold for social care technology? The CEO of TEC Services Association, Alyson Scurfield, talks of the development of social care technology and what benefits this can bring. Alyson Scurfield, of TEC Services Association, outlines the benefits of bringing health and social care systems out of the digital dark ages and embracing the opportunities social care technology has to offer. We’re on the brink of a technology revolution in healthcare, not just in the UK but all across the world. Every week social care technology brings us new services, apps and devices, that enable us to monitor our health and fitness, as well as to help us care for our loved ones. What surprises people the most, though, is that despite this new technology at our fingertips, our health and social care systems are in the digital dark ages when compared to other sectors such as banking and retail. Most legacy care technology has been around since the fax machine era, running on traditional telecoms infrastructure using copper wire and tone dialling. In a social care and community housing context the investment in infrastructure and equipment has been pretty stagnant due to pressures on public finances – austerity measures coupled with an ageing population and prevalence of chronic conditions have put unprecedented pressure on care services. It’s not all doom and gloom, though. The winds of change are in the air. Social care technology, along with innovation is evident in small pockets, led by equipment and systems providers, consultancies and forward-thinking municipalities. Whilst being new and exciting, these examples of creativity in service delivery are sporadic and in that usual cycle of pilot or trial – never quite becoming mainstream. Scalability is possible (and often provable), but funding, and perhaps a bit of bravery, is a barrier to wider scale adoption. 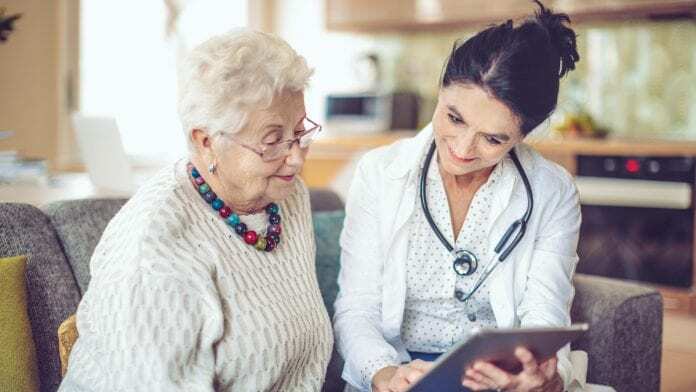 Late last year NHS Digital and the Local Government Association awarded a share of £700,000 (~€800,000) to nine projects to pilot some innovative care technology schemes. Led by Local Authorities, many of which are TSA members, the solutions include community digital kiosks, exoskeleton devices which can help in manual handling, apps for care package self-assessment, a data visualisation tool and the use of biometric wearable devices for people with autism and complex learning disabilities. Let’s hope that at least some of these schemes make it beyond the pilot stage. The UK Secretary of State for Health and Social Care, Rt Hon Matt Hancock, an admitted technophile, launched in October 2018 a draft paper on his digital vision for health and care in England. This vision is bold and goes some way in highlighting the inadequacies of current healthcare technology. Hancock himself has been quoted as saying ‘we need a bonfire of the fax machines’ – absolutely we do. In the UK in 2025 our old analogue phone networks will become obsolete. Starting now we are in the process of migrating to IP, or internet-based services, where voice and data are transmitted over a broadband network. Many European countries have already made this transition or are currently doing so. Whilst 2025 may seem a long time in the future, it’s just a digital heartbeat away for large public institutions. Widespread use of SMS messaging has only recently been adopted by GPs and the NHS despite the technology being around since the 1990s. What’s definite, though, apart from the inevitability of the IP switchover, is the opportunity that this will offer in health and social care settings. Technology-enabled care (TEC) can really spread its wings in a full digital ecosystem. The uber-complexity of modern systems goes beyond even the more tech-savvy of us, so new systems will require specialist support to undertake installations and to train people and their carers. This workforce development will come at a cost on top of the initial investment in new equipment. Costs can be recouped elsewhere of course. Systems that operate over the internet or mobile networks via ‘the cloud’ do not require dedicated infrastructure beyond what’s already in place from a broadband and electricity provider, and can be updated remotely. Over time there are infrastructure and resource efficiencies to be made. So, I guess the conclusion is that costs will be incurred. And saved. A digital status quo? Maybe. Real savings (in lives and costs) can be made where the whole system is reimagined. Overlaying new tech on a broken system will not fix anything. Want to read more about the possibilities of social care technology? Curious about standards, interoperability and cybersecurity? Interested in what more TEC Services Association has to say? Stay tuned for more, as the rest of this article will appear in issue 8 of Health Europa Quarterly, which will be published in February 2019. What do you know about the new CRISPR Cas9 gene editing system?